My interest in preparedness began in the 90's, but my memories of food storage go back further than that. I remember the canned food rotation shelf my wise father built in the coat closet growing up. And how natural it was for us kids to go there to get cans of food for meal preparation. I'm sure I was fascinated when we loaded the shelves because you could put a can in the top, and see it roll behind the other cans that were put in first. Amazing! My parents have been good examples of "Preparing Every Needful Thing." They taught me the importance of being careful with money, keeping your commitments and being obedient. I think growing up in a family of 8 was a great place to learn. Now with my own family of nine, I have learned that being a wise steward with what God has given us is a way that we show our love for him. In times of economic or personal trials it is to him that I turn for strength and guidance, and he is always there to guide me. I am so thankful for the inspiration that comes as I ponder what I can share to help others with this blog. If my mind is blank, I don’t write. I have been blessed in so many ways, and my cup is overflowing. Elder Albrechtsen towers over everyone. I have 4 children living at home, a son away at college, a married daughter and son-in-law in college, and a son serving a mission in Lima, Peru. 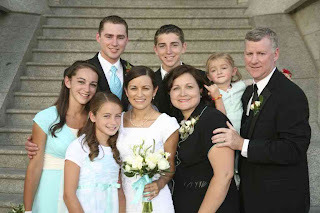 I deal with all aspects of mothering as I help our 7 children of varying ages from 5 to 24. My love for writing began at Yorba Linda Jr. High when my English teacher, Mr. Blue, said I was a promising writer. Those junior high compliments go a long way. I wrote for my high school and college newspapers, and felt that if I could become a free-lance writer I would still be able to stay at home with my kids. Blogging is a great way to do that. I created this blog as a way of letting my voice be heard about food storage, saving money, and emergency preparedness. Things I am fascinated with, but am in no way an expert on. However, I am an expert in the knowledge that preparedness brings great peace. My blog is a way to give back to my brothers and sisters in this world in my own small way. Even though I am a member of the Church of Jesus Christ of Latter-day Saints, I welcome people of all faiths to read and share on my blog. I hope you enjoy it. Keep the faith. I just came across your site yesterday. Thank you, it's really great! I like to organize everything, so I love your binder idea. My husband's family is from Bountiful now and formerly Riverside. His cousin is also currently serving in Lima!! How exciting! Thank you so much for sharing your time and talents with us. I tell everyone I can about your blog. It's really one of the best I've found . . . and they're are a lot of them out there! So today as I was feverishly searching the internet for some great ideas on 72 hour kits/emer prep, I found your blog. I think I've spent the last 4 hours reading and using ever last thing. Then I decided to go through all your older posts and I come to this one. I guess I was a bit surprised to see your family picture and your husband's familiar face! I am in the Arlington Heights ward and served in the YW stake presidency when your husband was in the stake presidency. This site is AMAZING and you are awesome! I am really wishing you hadn't left California right about now!! THanks for all the great info. I will be a regular follower now. Today as I was searching the internet for some great 72 hour kit ideas, I happened on your blog. Since then I have spent the last 6 hours reading and using just about EVERYTHING. Then as I was reading through all your older entries I came upon this one and recognized your husband's familiar face. I am in the Arlington Heights ward and was serving in the YW stake presidency when he was in. You are AMAZING and this site is AWESOME! Thank you for sharing so much useful information. Man am I wishing you didn't leave California! I have to say that even though I am not Mormon, I find your blog to be a wealth of knowledge and information. Thank you so much! It truly is one of the more comprehensive sites, both blog and non-blog, out there on preparedness. I see you're also in CERT or have been at one point. I currently am serving as a CERT member for Travis County in Austin, Texas and have been a member since 2005. Your blog has saved me so much money on my food storage purchases during case lot time. Over $100! Thank you for letting us know what was on sale at Maceys as opposed to my ONLY grocery store here in Montpelier, Idaho. I truly appreciate all your great ideas! I just found your blog and you have great ideas. I just got put in as the "food storage specialist" in my ward. I'm a little nervous about it. I'm sure I'll be using some of your ideas. I just found your blog, you have great ideas. I just got put in as the "food storage specialist" in my ward. I'm a little nervous about it. I'm sure I'll be using some of your ideas. Thank you for sharing.